What are ways in our community to support our children with special needs? A few years ago, I was managing school art residencies for ArtMix (formerly VSA Indiana). I scheduled one of our Teaching Artists to make weekly visits and co-teach with a first-year special education teacher in a central Indiana high school. The new teacher was responsible for providing regular, ongoing lessons in the visual arts and she was eager to learn from our veteran Teaching Artist. 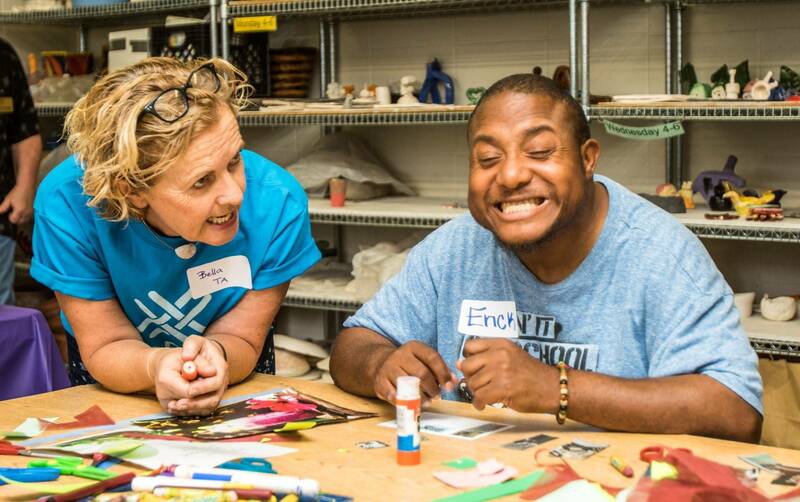 What she learned went far beyond basic arts skills and adaptations for students with disabilities. Our Teaching Artist organized a field trip within the school so that the special education students could visit the art department classrooms and learn about various art tools and equipment. The Teaching Artist tried to conduct a session of the special education class in one of the art department classrooms but had no luck, so she then asked for some of the tools and equipment to be delivered to the special education classroom. What they received was dusty, second-hand, and ultimately proved to be broken and unusable. The new teacher and busy classroom aides, accustomed to improvising and making do, were startled when the Teaching Artist declared, “No. This is not acceptable!” The broken equipment was returned with a polite but firm demand for a working replacement, which did eventually arrive. This story offends our sense of basic justice and equity, but is not, unfortunately, an isolated example. Disability can range from mild to profound, it can be temporary or permanent, and it can be visible or invisible, but the fact is, the label of disability can often be more disabling than the disability itself. Somehow we think that because students with disabilities may learn and achieve less or differently, they therefore need less or different resources. The truth is children with disabilities are first and foremost children and, just like the rest of us, will usually rise to meet our expectations. And we should have expectations for students with disabilities, particularly when the difference between meeting and missing an expectation can be found in basic adaptations or modifications. Yes, some students are profoundly disabled, requiring specialized care, complicated supports, and modified learning goals, but most students with disabilities should be expected to progress. A key to success in the classroom for any student, not just a student with disabilities, is supplying appropriate adaptations, modifications, and supports. In ArtMix programs, access to the arts is provided to people with disabilities as a basic right as well as an opportunity for achievement. As an instructional tool the arts are naturally inclusive of varying ability, offering multiple means of conveying information, multiple means of expressing understanding, and multiple means of engaging learner interest. The arts teach us that problems can have more than one solution and that multiple perspectives are the norm not the exception. Just ask a class of students to draw the sun and see what they create. The arts can also be powerful because they provide a context for being creative and crafting something, allowing the participant to be a creator, to be constructive, to be able. In this way students with disabilities can assume a new label, that of artist, a label which can allow them to be defined by their ability rather than their disability. Our community can play an important role in supporting students with disabilities just as it supports students without disabilities – provide resources and supports, utilize appropriate expectations, and allow students to define and express their identity. Let’s politely but firmly demand equity in educational opportunities for all students. When we do, our students and our community both succeed. Gayle Morton Holtman serves as President & CEO of ArtMix (formerly VSA Indiana), a statewide nonprofit providing access to the arts for people with disabilities. Born and raised in Indianapolis, Holtman is a graduate of Wittenberg University. In 2008 she was named the Outstanding Special Needs Educator of the Year by the Art Education Association of Indiana, and in 2011 she received a Community Arts Leadership Award from the Indiana Coalition for the Arts.